Sticking with healthy habits isn’t always easy, especially if you try to make too many changes all at once. If you find yourself feeling overwhelmed at the thought of it all, go back to starting small. #1: Sneak in an extra serving of veggies at breakfast. Most of us could use an extra daily serving of vegetables (or two or three), but it isn’t always easy to do with a busy schedule and on-the-go meals. Sure, munching on broccoli first thing in the morning isn’t exactly appetizing, so try tossing in a handful of spinach (or your favorite greens) in to your morning smoothie or eggs to start your day with a healthy dose of vitamins. #2: Stare at something awesome. Did you know that simply looking at an image of something awe inspiring (like the Grand Canyon) for a few seconds is enough to make you feel happier and even enhance your quality of life? One Stanford University study found that when subjects watched a 60-second commercial featuring ‘awesome’ images (think space exploration, waterfalls, whales), they all felt they had more time to get things done afterwards. Researchers believe that seeing these types of images can signal our brains to feel more present and even expand our sense of time, leading to greater feelings of happiness and contentment. Pretty cool, right? 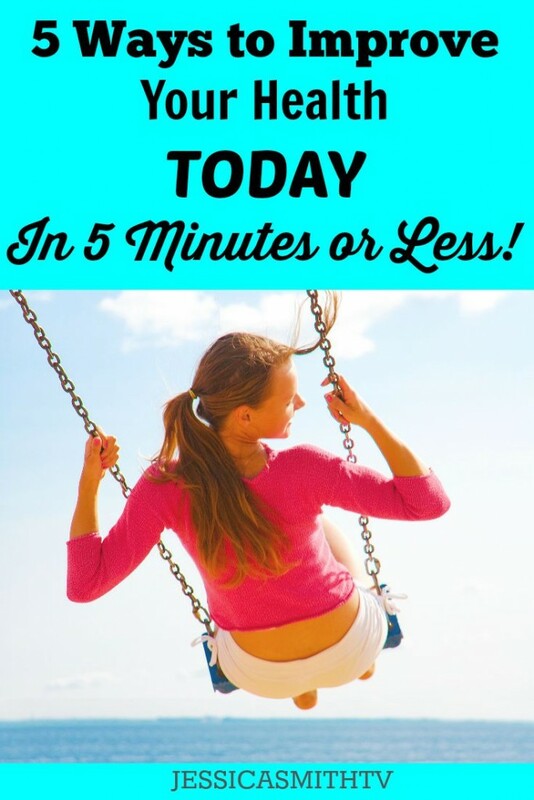 #3: Take a 5-minute fitness break. Just five little extra minutes of movement during your day can do a lot for boosting your energy, mood and, over time, even your calorie burn total for the week! Walk around the block, do a few sets of jumping jacks or squeeze in a 5 minute, total body workout any time of the day or night with this no equipment needed workout video. (Did you know we have an entire series of 5 minute workouts on our YouTube channel? Check out the playlist here). #4: Flex your gratitude muscle. Studies show that having an ‘attitude of gratitude’ can do everything from improve your immune system, quality of sleep and even help you stick with your workout plan! Spend 5 minutes (or less) writing down 3 things you are grateful for today to start building your gratitude muscle. #5: Brush your teeth with your non-dominant hand. This one may sound a little wacky, but it’s great for your brain! “When you perform a task like brushing your teeth or pouring a glass of water you stimulate a specific neural pathway in your brain, and every time you use that pathway it becomes stronger. By using your non-dominant hand, you will begin strengthening new pathways in your brain,” explains Dr. Marie Pasinski, a neurologist at Massachusetts General Hospital, faculty member at Harvard Medical School and author of A Beautiful Brain, A Beautiful You. It may be a little more challenging, but Dr. Pasinski says even small little steps like switching hands during everyday activities can redesign and build up the infrastructure of your brain, and research suggests that this kind of stimulation can help keep you mentally sharp and lower your risk of cognitive decline. For more ways to strengthen your mental muscles, don’t miss our “Brain Booster” walk on our new “Walk On: 5 Fat Burning Miles” DVD. It’s full of specific exercises designed to help bolster one of the most important parts of your body, your brain! Imagine how healthy you’d be (and feel!) one year from now if you just did made a single, 5 minute-or-less improvement a day.